Easy to make gingerbread birdhouses are a fabulous idea for a bridal or baby shower. Use as part of your gift, or if you are hosting, make one for each of your guests to take home. Pre-baked gingerbread house pieces are ready for icing. Create whimsical wonders by using royal icing as your base. Let dry. Use food color stamp technique by using an un-inked stamp pad with a few drops of your desired color of food color. Using your favorite stamp, dip into pad and blot off with paper towel. Stamp onto dried royal icing, just as you would if you were stamping on paper. 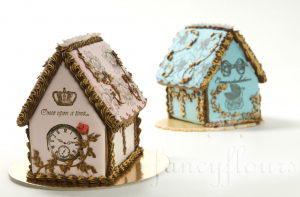 After the stamped design had dried, assemble your house using thickened royal icing. Once your house is standing and has completely set, pipe decorative borders around the edges, using additional royal icing. To create shimmering effect on your decorative borders, try using luster dust. Mix luster dust with a few drops of an alcohol-base (like white vanilla or almond extract) to create water-color like paste. Paint luster dust on with paint brush. Let dry. Voila! Your gingerbread masterpiece is ready for display (or to be eaten)! Shop fancyflours.com for gingerbread house pieces, luster dust, royal icing and more! This entry was posted in Instructions & How-To's by Fancy Flours. Bookmark the permalink. what a darling & FAB idea! thank you for sharing! These are so absolutely gorgeous! What food colour was used to stamp onto the royal icing? It seems to have its own lustre, or was that added?